The side of interest to be studied is placed closer to image receptor. Put on upright if possible, slightly spread feet and ensure weight of the patient is distributed on both feet. Patient should not lean toward or away from stand wall bucky or image receptor. Arm raised to prevent superimposition to the lung area. Raise chin and patient is looking straight. To determine rotation the posterior ribs in not superimposed with each pair. Provide lead shield, secured around waist to protect gonads. Patient is in erect position. Left or Right side against the image receptor depending on physicians request. Commonly the left lateral is done if not stated on request. Slightly spread feet, and weight is evenly distributed on boot feet. Raised arm above head and chin up. Patient, central ray, and image receptor are aligned anteriorly and posteriorly. Perpendicular coronal plane to IR. Parallel sagital plane to IR. Lower central ray and image receptor compared with PA projection if needed. For slender but broader shoulder patients do not force hip and lower thorax to touch the grid wall bucky, this will result to, midsagital plane will not be parallel with the IR. Patient pelvic and lower thorax leaning against the IR will result in foreshortened or distorted image of all thoracic structures. Forward bending of patient will result in distorted structural outlines. Central Ray and Image Receptor should be adjusted down to a minimum of 1 inch from PA projection. Because of the increased OID in lateral view, the divergence of x-ray beam on lateral position will be resulting in a lower projected costophrenic angles. The left lateral chest x-ray patient is rotated to either right or left 90° from AP or PA position. Left lateral will best demonstrate the left pulmonary lesions and the heart. Otherwise, Right lateral will best demonstrate the right lung lesions. These two projections are use to extensively study and rule out the inter lobar fissures, differentiate the lung lobes, and to localize some of possible pulmonary lesions. 4 side to area of the lung fields. Arms above head and raise chin. Place arm upward, flex elbows and arm is resting on elbows. Use an IV stand, by placing it in front of patient and let them hold or grasp as high as possible for weak and unsteady patients. Place the patient in true lateral position. Mid-sagital plane is parallel to IR and shoulder is resting on stand wall bucky. Mid-coronal plane is perpendicular and centered to image receptor or bucky. The upper margin of image receptor is 1.5 to 2 inches above shoulder. Lateral view of the chest is also usually requested on trauma patients, or patient cannot stand especially on blunt or vehicular accident injuries. When taking a radiograph with this kind of situations, take radiographic image with a sitting high position or make them as nearly erect as possible on all attempts of exposure. Old age and traumatic patient are the usual patient to position in wheelchair or in stretchers, and sometime it is very difficult to position when taking radiograph. But doing so, always attempt to let patient sit completely erect in wheelchair or cart and stretchers, this will demonstrate the air-fluid level in the lungs, specially on patient with a possible pleural effusion or pneumothorax; like for ex. vehicular accident victim or the patient had a blunt trauma injuries. Dengue fever (mosquito bite disease) patients will possibly develop a fluid in their lungs, which is caused by internal bleeding due to a very low platelet counts. Therefore, the patient should be on erect sitting high position to possibly to demonstrate the fluid level in their lungs. Below a brief guide to position a patient in stretcher or in wheelchair. Remove armrest of the wheelchair (if removable) so that it won't superimpose to the lower lungs. Turn wheelchair and patient in lateral position and place the as near as possible to IR. Place a radiolucent board behind patient's back for support while leaning. If support bar is available, instruct patient to hold as high as possible. Posterior ribs is superimposed to vertebral column. Patient's Arm or its soft tissue is not included on radiograph or not superimposed on lung area. The entire lungs should be included on radiograph without forward or backward bending or leaning. Clear image of the lateral view sternum with no rotation. The lower apices and costrophrenic angles are included on radiograph with no cut-off. Adequate radiation factor used, to penetrate the thoracic structures. 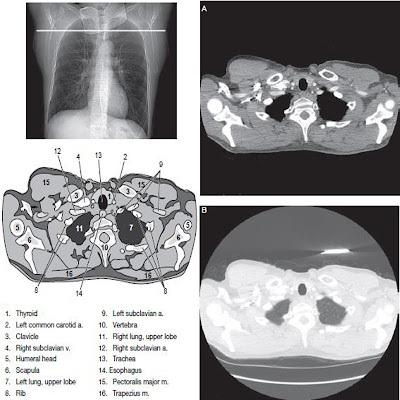 Intervetebral disk spaces and foraminal appeared open, except for patients with scoliosis. Optimal density of thoracic structures and a sharp outlines of diaphragm and heart. The Hilum is in the center of the radiograph.